IK Multimedia has recently released the IK Multimedia Fender Collection 2, bringing that classic Fender tweed sound to your computer, iPhone or iPad. With such a range of genres these amps have been known to cover, these classic amps from the fifties and sixties are a welcome addition to any amp arsenal. Now, the company has been on a roll of late. Recently, we took a look at the IK Multimedia iRig Acoustic Stage, and were impressed with the results. Can it continue this trend with the Fender Collection 2? Fender Collection 2 is beautifully designed with seven different amp simulations to choose from. If you’ve used these amps before, you’ll feel comfortable with a matching control layout within AmpliTube. The interface is visually impressive, making it feel immersive and hands-on. Signal flow in AmpliTube allows for many different effect options, like swapping a cab speaker or tossing a stompbox in front of the amp section. If you’ve never used AmpliTube before, there is a bit of a learning curve to conquer before feeling accustomed to where the controls are laid out. While AmpliTube 4 brings some very in-depth customization and advanced tools to the interface, it also clutters the workspace which can be confusing when getting started. That being said, Fender Collection 2 benefits greatly from the advanced microphone selection and the ability to tweak specific stomp boxes and swap out cabs to make a more personalized setup. One thing to notice about the amplifiers in the Fender Collection 2 is the impressive attention to detail. These amps all have unique qualities and they all sound as true as their originals. Even slight adjustments make big changes to tone. Pulling back the guitar volume gives a cleaner color, especially using the ’57 Custom Champ. Turn it back up and you get great crunch and attack. Another example of the precision taken to execute such great simulations is the controls of the ’53 Bassman amp. This amp is simple, with just a tone and volume control knob. What brings it to a new level is the circuitry switch on the right of the panel labeled “New” or “Worn Out,” which goes between a tighter low end to something a bit more open. These little details set apart Fender Collection 2 from other amp collections. Starting with just simple setups of guitar into an amp sounds amazing in Fender Collection 2. We tested out the collection with a few different guitars and pickups to see which sounds were the most authentic. Using a Fender Stratocaster with the ’65 Super Reverb really makes the amp shine. The speed and intensity controls for the vibrato are smooth and add a nice touch of modulation. Subtle adjustments in the middle and bass controls allow for total control of tone, and sounds as nice as the authentic hardware. Brightness switches on many of the amps in the collection add a lot more than just a treble boost, but also a sort of presence and punch that you don’t get from just the EQ. The ’57 Custom Twin is a classic example of this. Flipping the brighter switch and pairing that with a powerful humbucker pickup brings some crispy crunch to your tone that makes any overdrive or saturation jealous. Make sure to take advantage of the different features AmpliTube offers to further refine these amps, like the microphone selection options, inserts and rack options. A fun one is adding a delay in the rack for lead and solo lines. Paired with the ’57 Bandmaster and trying the “In Da Room” preset gives a full and rich lead tone that benefits from the compression stompbox in front. 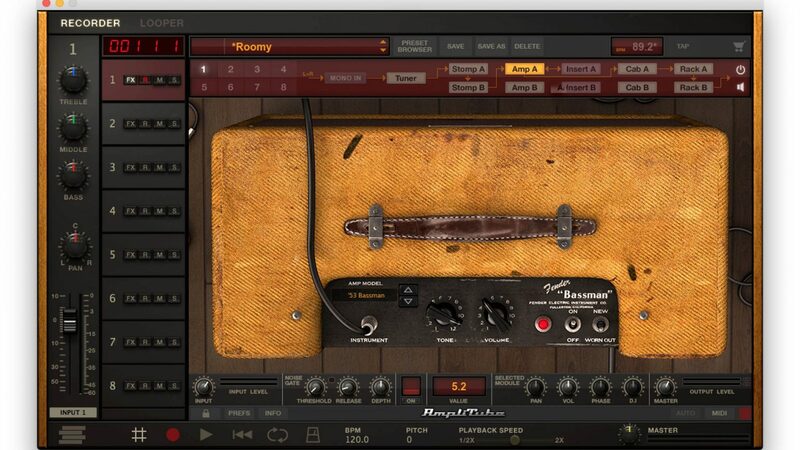 For owners of AmpliTube 4, the Fender Collection 2 is a great choice for adding a variety of sounds to the toolkit. The versatility of these amps is impressive and stands up very well to their real world counterparts. There’s an stunning amount of control available in the Fender Collection compared to using the stock amps from AmpliTube, and this makes it very worth the money. These new Fender amps are even available on iOS, making it easier than ever to bring your own sound to the stage and anywhere on the go.